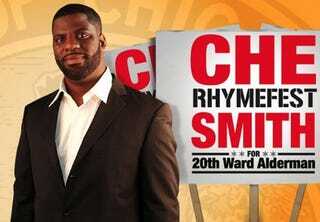 Rhymefest paints himself as an alternative to business as usual for the 20th Ward, which includes some of the poorest and highest-crime areas of Chicago. First-term Alderman Willie Cochran, who faces a groundswell of opposition, was elected to succeed former Alderman Arenda Troutman. She was sentenced to prison in 2009 after pleading guilty to taking payoffs and campaign contributions from developers in return for zoning changes. The 33-year-old rapper — named Che after the 1950s Cuban revolutionary Che Guevara — has pledged to give up a portion of his aldermanic salary for loans to bring business to the area and says he'll only serve two four-year terms. His campaign headquarters are inside a dingy car wash surrounded by vacant lots, and some of his fundraisers have been held at nightclubs where he performs. Rhymefest has received praise from Princeton University scholar Cornel West and rapper Kanye West, with whom he shared a Grammy for co-writing "Jesus Walks." Sounds great, except … it came up during a recent campaign forum that he's been convicted on domestic violence charges and for firing a gun after a dispute with a real estate agent. Seems that while a rap career may be the most interesting part of this candidate's resume, it's not actually the most controversial. In other news: Malcolm X’s Daughters Speak Out on Assassination Anniversary.